The movie Alice in Wonderland directed by Tim Burton for Walt Disney Pictures: trailer, clips, photos, soundtrack, news and much more! Don’t be late for tea! Director Tim Burton really brought to life the world imagined by Lewis Carroll! One can’t deny that the movie Alice in Wonderland looks gorgeous! I’d even say that it looks way better than James cameron’s Avatar! Tim Burton’s Alice in Wonderland will be psychedelic and absurdly funny! A beautiful song for Alice in Wonderland! 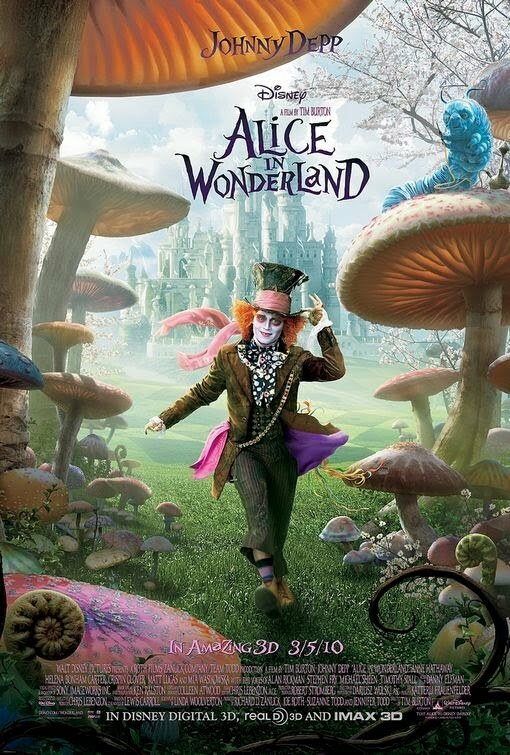 The movie Alice in Wonderland will be released on March 5, 2010: you’ve got a very important 3D date: don’t forget! A very smart rabbit, but he’s under pressure: time’s always ticking and flying for him! The Cheshire cat is an intelligent yet mischievous character that sometimes helps Alice and sometimes gets her into trouble. In Tim Burton’s Alice in Wonderland, The Cheshire cat is voiced by Stephen Fry. The official theme song of Alice in Wonderland by Avril Lavigne makes this footage just wonderful! Tim Burton really brings to life the psychedelic world imagined by Lewis Carroll! Tim Burton’s Alice in Wonderland definitely looks like something we’ve never seen before! Johnny Depp talks about playing the Mad Hatter. I play the Mad hatter. He’s mad, he’s unpredictable. You see instantly what he’s feeling: his emotions are very close to the surface. He’s a fascinating character! The Mad Hatter is a character as fascinating as Johnny Depp himself. In amazing 3D in 2010Do you think that the fat cat sitting next to Alice is a banker? Alice wants to fly away from here red haired suitor and from the depressing Victorian society she’s living in: that’s how she get back to Wonderland. But things have changed since her last journey there, and not for the best…. With Alice in Wonderland, Director Tim Burton is bringing us a marvelous movie, epic 3D fantasy adventure tha one should not miss! Alice in Wonderland will hit theaters on March 5, 2010. This second trailer o Alice in Wonderland just confirms that Tim Burton did a hell of job and that the film is going to be a winner! 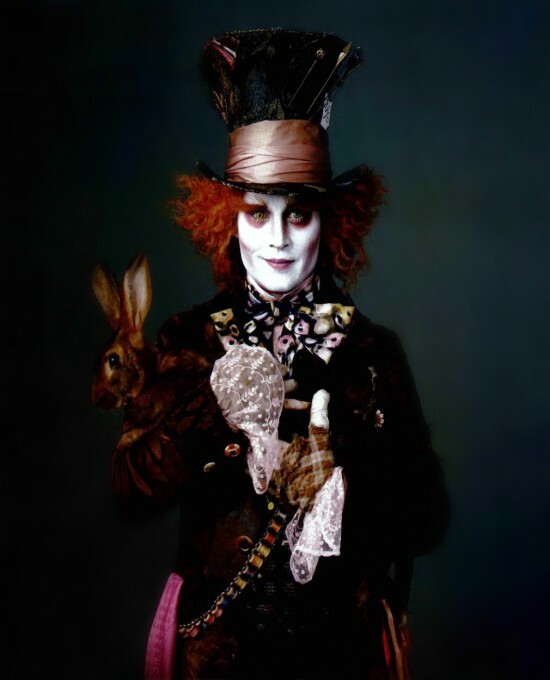 Get ready for the damn twisted Mad Hatter that Johnny Depp is going to deliver in the movie Alice in Wonderland! The smiling cat on this poster of Alice in Wonderland must be related to some degree to my brother’s cat: I swear they got the same smile! Tim Burton will be the most psychedelic version ever of Alice in Wonderland! Beyond the gate, a new world is waiting for Alice! Those two fat little men named Tweedledum and Tweedledee look like the dumb minions of the Octopus in the movie The Spirit. The Mad Hatter (Johnny Depp) looks like crazy! I’m really found of Tim Burton’s ability to magnify details for the best in his movies. I believe that Tim Burton’s Alice in Wonderland will be a blockbuster! Probably more to come for Alice in Wonderland with the Comic Con ahead, maybe even a trailer of Alice in Wonderland, well hope so! Tim Burton’s Alice in Wonderland is currently in post-production. The movie will be released on March 5, 2010. Johnny Depp who plays the role of the Mad Hatter looks great with his rabbit, Mia Wasikowska (as Alice) too, but Helena Bonham Carter (the Red Queen) steals the show with her a pig: she’s royally gorgeous! Love those pics of Tim Burton’s Alice in Wonderland! Update: A second movie trailer of Alice in Wonderland is available! Tim Burton will for sure amaze us with his brand new take on Alice in Wonderland.